Arab Engineering Bureau (AEB) has received the ISO 9001:2015, ISO 14001:2015 and OHSAS 18001:2007 certifications, the international standards for quality, environmental and HSE management for its full-fledged Pre and Post-Contract services. The firm received overall Management System certification in “Architectural and Engineering Design, Project Management and Construction Supervision Consultancy Services”. The receipt of such important certification highlights AEB’s commitment to ensure the highest quality architectural and engineering design and management, and HSE services to its clients. Developed by International Organization for Standardization ISO 9001:2015 is a world-recognized standard for quality management. ISO 14001:2015 is the best practice standard related to environmental management. And lastly, OHSAS 18001:2007 is recognized occupational health and safety management system. 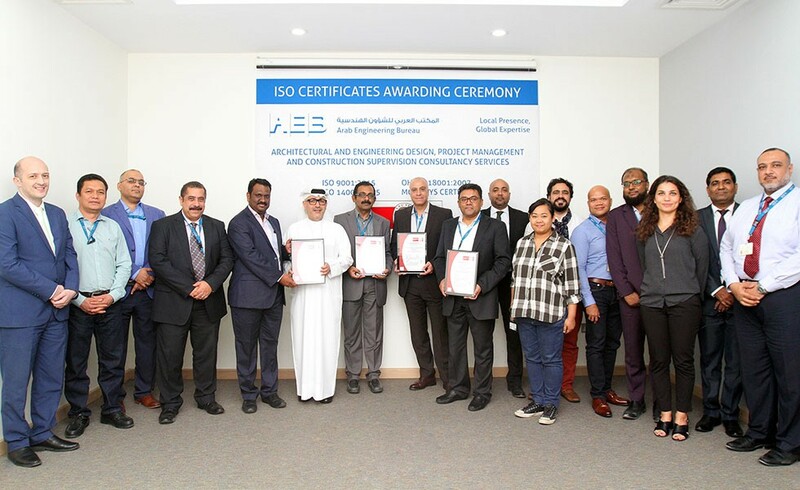 A special ceremony was held at AEB headquarters on 04 July 2018 to officially award the achievement of ISO certifications for both Pre- and Post-Contract Services. During the event M/s. Bureau Veritas formally handed the ISO and OHSAS Certificates to the Top Management of AEB. In attendance were also senior executives and Integrated Management System (IMS) Review Team.